Eva Walker is a seventeen-year-old math genius. And if that doesn’t do wonders for her popularity, there’s another thing that makes it even worse: when she touches another person or anything that belongs to them — from clothes to textbooks to cell phones — she sees a vision of their emotions. She can read a person’s fears and anxieties, their secrets and loves … and what they have yet to learn about calculus. This is helpful for her work as a math tutor, but it means she can never get close to people. Eva avoids touching anyone and everyone. People think it’s because she’s a clean freak — with the emphasis on freak — but it›s all she can do to protect herself from other people’s issues. 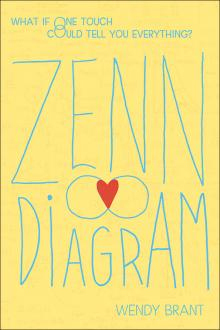 Zenn Diagram, Wendy Brant’s sparkling debut novel, offers an irresistible combination of math and romance, with just a hint of the paranormal. Readers will swoon over Zenn and connect instantly with Eva, the most fully drawn prodigy in teen fiction today.